The Hot Wheels Ultimate Track exhibit at the Art Gallery of Ontario. (Image: Hot Wheels). With its soaring, twisting orange and blue pieces of track, arcing around to allow tiny cars to surge down its plastic freeways, it’s easy to imagine why Hot Wheels Canada’s new Ultimate Track is a jaw-dropping exhibit for kids who love cars. On display at the Art Gallery of Ontario (AGO) in Toronto, the exhibit is made up of more than 1,000 pieces of track and connectors, as well as 79 boosters, measuring in at over 190 meters against a backdrop that’s made to look like the average house. All told, the project took three months to design and 15 days to build, plus a round-the-clock 24-hour session when it had to be taken apart and then rebuilt at the AGO exhibition site. 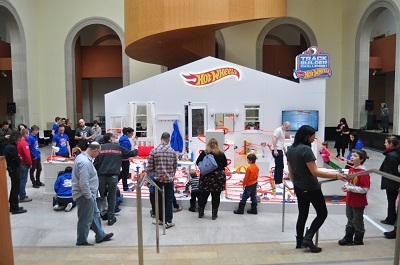 The Hot Wheels Ultimate Track is on display at the Art Gallery of Ontario until March 16. (Image: Hot Wheels). There’s a tech aspect to the project as well – all alongside the side of the tracks, the builders have mounted a number of GoPro cameras, customized microcontrollers, and Livestream Broadcaster devices, allowing people who can’t visit the AGO to check out the exhibit online instead. They can even control parts of the track remotely, either by tweeting with specific hashtags to turn a porch light on and off, or by using the exhibit’s website to launch a car on the track or to get the cars to switch lanes. 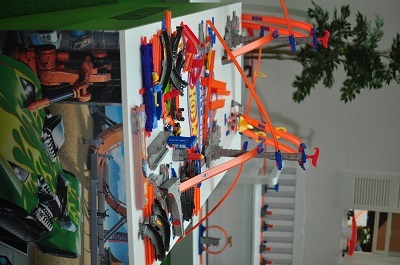 Plus, there’s a contest challenging kids to build their own tracks and upload pictures on the site, with the winner getting a track party where Hot Wheels will send builders to make a giant indoor track in his or her house. While the Ultimate Track is a cool project for the kids – and maybe some of their parents – it’s also a great example of melding digital marketing with the physical world, says Danielle Minard, senior manager of consumer engagement at TrojanOne Ltd., the Toronto-based marketing agency behind the campaign. That means TrojanOne has been investing more heavily in technology to drive its clients’ campaigns. It’s a core part of promoting Hot Wheels’ brand, as well as the brand of its parent company, Mattel Inc., she adds. 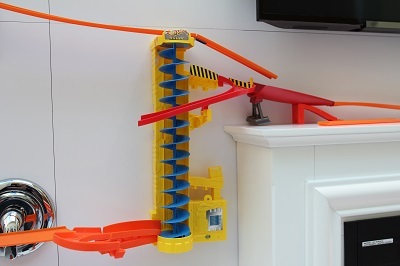 The Hot Wheels remote car launcher. (Image: Hot Wheels). In November 2013, TrojanOne was working on building out its digital subsidiary, Wondermakr, by hiring Garrett Reynolds, who comes from an engineering background. The Hot Wheels Ultimate Track play tables. (Image: Hot Wheels). Reynolds, who was the chief technologist and lead builder of the Ultimate Track project, says he never imagined himself working in marketing – after all, his last job was in automation engineering, something that is much more standardized. But he says he feels his new role is one that makes sense, given how tech and marketing now work together. “I think [tech in marketing] gives us a new avenue in being able to interact with the people passing by, as opposed to just entering contests and giveaways and stuff. But everybody now in our generation is much more tech-savvy, and much more interested in interacting with things, now they all have smartphones,” he says. The Hot Wheels Ultimate Track exhibit runs until Sunday at the AGO.